If you haven’t read my review of the R1 TechFace Hoody, I would definitely start there. These two pieces are very similar and use the same fabric, so I’ll be referring to that review a lot when talking about the Pullover version. One of the big differences between the R1 TechFace Hoody and Pullover is the fit. The Hoody version fits very much like a shell with plenty of room to layer underneath and longer cut in the sleeves and torso. The Pullover version is noticeably trimmer in the body, about an inch shorter, and has slimmer and much shorter sleeves. 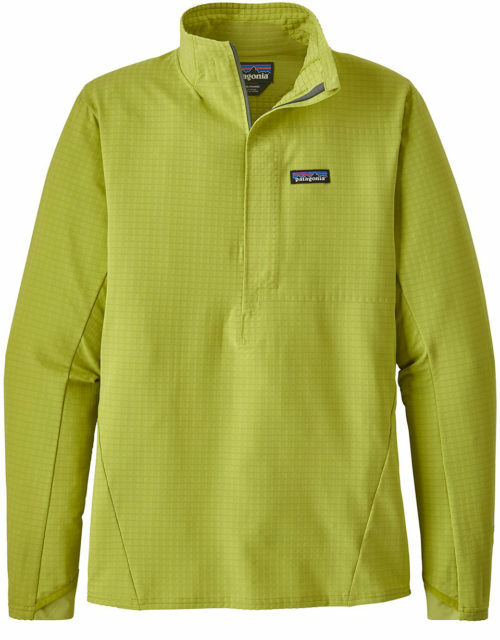 I think Patagonia nailed the fit on the R1 TechFace Pullover. It gives me just enough room to have unencumbered movement, while not having much extra fabric to bunch up around my wrists or a pack’s hip belt. I can fit a very thin mid layer comfortably under the Pullover (like The North Face Dolomiti) but not much else. However, as I’ll discuss later, I don’t really find myself wanting to layer anything under the TechFace Pullover when I’m in the mountains. Just like with the Hoody version though, the fit on the Pullover shouldn’t be confused with that of the regular R1 fleece (with is very slim and basically form fitting). Both of the TechFace pieces are roomier and should be thought of more as softshells rather than fleece / mid layers when it comes to fit. The R1 TechFace Pullover is very bare on features. 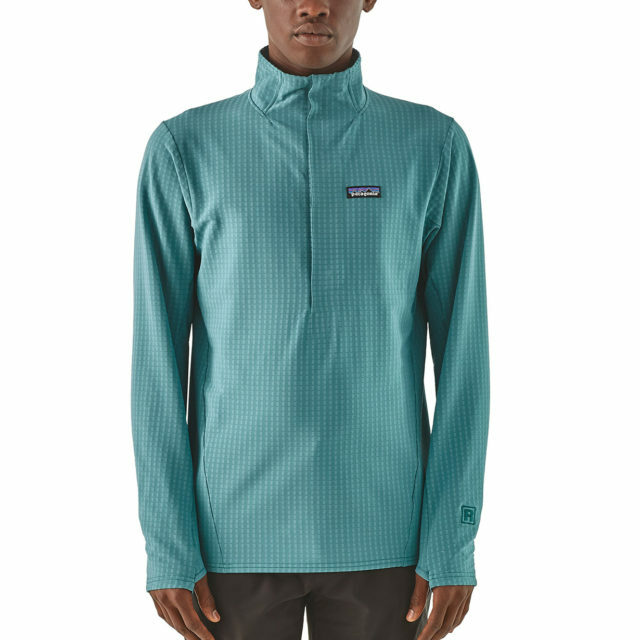 It has one zippered Napoleon chest pocket (which doubles as a stuff sack), Patagonia’s excellent cuffs (with thumb holes), and a ¼ zip down the front. That’s pretty much it. Just like on the Hoody, the cuffs on the R1 TechFace Pullover are excellent. They are slim and low profile, fit well under bigger gloves, fit well over thin liner gloves, and Patagonia added thumb holes to the Pullover’s cuffs (if that’s what you’re into). I can also pull the sleeves up around my forearms comfortably to dump heat or to just get them out of the way. These cuffs are my favorite across the market right now for mid layers or softshells — everything I need and nothing I don’t in a very minimalistic design. The thing that really makes the Pullover version standout from the Hoody version is the minimal feature set. When I use the Hoody, I’m almost always wearing a pack with a hip belt that covers the hand pockets, essentially making them useless. The lack of hand pockets on the Pullover saves valuable weight and increases the comfort of the piece when worn with a hip belt (the lack of full-length front zipper helps with comfort a bit too, as there isn’t anything to bunch up under the hip belt). 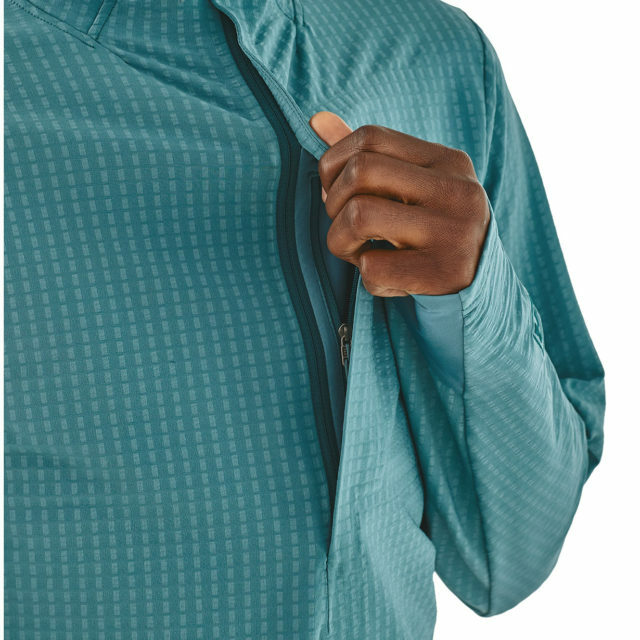 Another feature that the Pullover ditches from the Hoody is … the hood. Sometimes I do find myself wishing for a hood on the Pullover, mainly on gusty ridges when a hood might have prevented me from having to add a layer. But for the most part, the lack of hood isn’t an issue for me. It makes the Pullover fit under a shell or puffy a bit better than the Hoody version because of that. But if the lack of a hood is a dealbreaker, then go for the (extremely good) Hoody version. The R1 TechFace Pullover shaves a large amount of weight from the Hoody version, with the Pullover coming in at 287.5 grams in a size Medium (whereas the Hoody comes in at 416 g). Due to the very stripped-down feature set, the Pullover is one of the lightest softshell pieces we’ve tested. Here is a list of some notable pieces and our measured weights for them. Because the TechFace Pullover shares characteristics of both mid layers and softshells, we’ve included some pieces from both categories here. Remember to note the sizes to try to keep things more apples-to-apples. 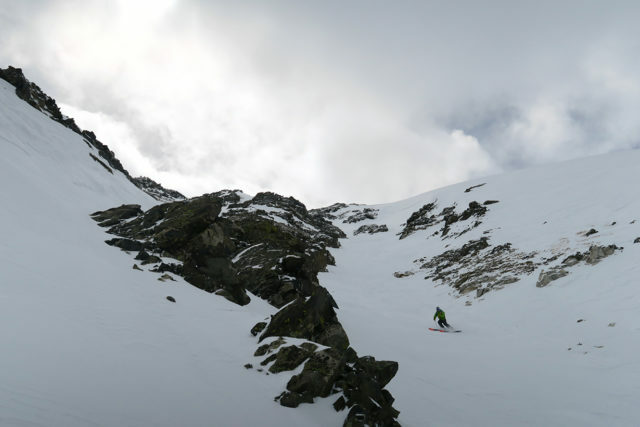 I will typically start off a ski-mountaineering day (often in the dark) wearing a lightweight, long-sleeve base layer and the R1 TechFace Hoody. On the way up, I’ll sometimes get warm enough to take the R1 TechFace Hoody all the way off. But I’ll usually just leave the front unzipped, and that’s often all I need for temperature regulation. The R1 TechFace Hoody breathes excellently given its weather resistance (more on that later). On the down (at least during fairly warm days in the spring), I’ll use the same layering scheme (R1 TechFace + light base layer), but throw on a puffy over the R1 TechFace for the transitions. Sometimes, if it is cold, I’ll leave a puffy on for the down until it gets too hot (usually the Rab Zero G or Patagonia Micro Puff Hoody). When the wind picks up, the R1 TechFace blocks a surprisingly significant amount of wind. I would say that in moderate winds around 20 mph, the R1 TechFace blocks about 70-80% of the wind (for comparison, I’d say the regular R1 blocks maybe 30% of similar winds). That’s seriously impressive. In higher winds, the R1 TechFace can get overpowered and feel a bit too breezy (for winds in roughly the 30-40 mph range). But usually, if it is that windy, I’m getting cold anyway so I tend to throw on a puffy insulator over the R1 TechFace and wear that until I get out of the wind. Because of its combination of minimal loft, good breathability, and great wind resistance, I haven’t spent much time in hardshells since I’ve started using the R1 TechFace (I’ve been using it mostly in late-winter and spring). For spring in Colorado, I rarely need any more weather resistance than the R1 TechFace offers. Granted, I haven’t had any bad weather days with really heavy snow / rain (I’m sure I would still use a hardshell in those scenarios). But overall, the R1 TechFace has been everything I need as an outer layer in decent weather — it has pretty much all of the weather protection I need while being significantly more breathable than most other shells. As I noted earlier, the R1 TechFace is surprisingly weather-resistant. When it comes to wind resistance, I would place the R1 TechFace well above the Nano-Air Light Hoody and Summit L2 FuseForm ½ Zip Hoodie, and just a hair below the Levitation Hoody. I’d say the R1 TechFace definitely fits into the softshell category for weather resistance, though on the less water-resistant end of the spectrum. It won’t shed water and wind nearly as well as a soft shell with a membrane like the Patagonia Knifeblade (RIP), but for days without much precipitation in the forecast (e.g., most days in Colorado), the R1 TechFace is all I need. I’ve even had it out in light snow with some brief spurts of heavier snow squalls. 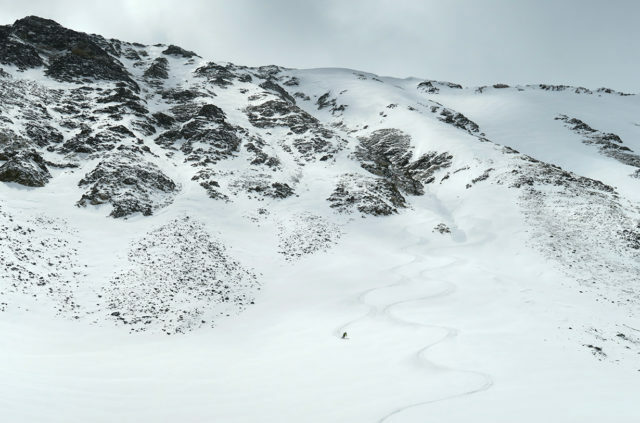 In the heavy snow, the R1 TechFace will definitely wet out, but in light or intermittent snow, it sheds snow adequately. While the R1 TechFace Pullover outperforms any fleece I’ve used when it comes to weather resistance, that comes with a slight tradeoff in terms of breathability. The R1 TechFace Pullover certainly breathes better than many mid layers and softshells (e.g., Patagonia Nano-Air Light & Levitation, Outdoor Research Ascendant, Marmot Alpha Pro, and Mammut Eisfeld Light SO), but the TechFace doesn’t breathe quite as well as its light, thin fabric might suggest. I would say the R1 TechFace Pullover breathes similarly to the (much thicker and slightly warmer) North Face Summit FuseForm L2 or the North Face Dolomiti, but not quite as well as the standard R1 Hoody (which is very breathable). In non-windy conditions (or when layered under a shell), the R1 TechFace Pullover is definitely not as warm as the standard R1 Hoody. But because it blocks so much wind, the R1 TechFace Pullover is a bit warmer than I would guess, based on how thin its fabric is. While the R1 TechFace’s fabric isn’t very lofty, its wind resistance means that it will keep you significantly warmer than a non-hard-face fleece when the wind picks up (as opposed to an open-knit fleece like the Rab Alpha Flash or Norrona Lofoten Alpha Raw Hoodie, which block essentially zero wind). I would say that the R1 TechFace Pullover isn’t quite as warm as the North Face Dolomiti or Summit L2 FuseForm ½ Hoodie (the L2 being a bit warmer than the Dolomiti), but the R1 TechFace Pullover is a bit warmer than the Levitation Hoody. The R1 TechFace Pullover is also not as warm as any of the active insulation pieces I’ve tested, such as the North Face Ventrix, Patagonia Nano-Air Light, and Outdoor Research Ascendant. For more on layering and the different types of layers out there, check out our Layering 101 article. No out of the ordinary wear or durability issues to mention here. I’ve worn the Hoody version on many hard days in the mountains, and I’m excited to use the Pullover a lot this spring. I’ll be sure to report back here if anything unusual pops up. The R1 TechFace Pullover is an excellent softshell for those who appreciate a minimalistic aesthetic, do a lot of high-output activities, prioritize low weight, and live in a drier climate. 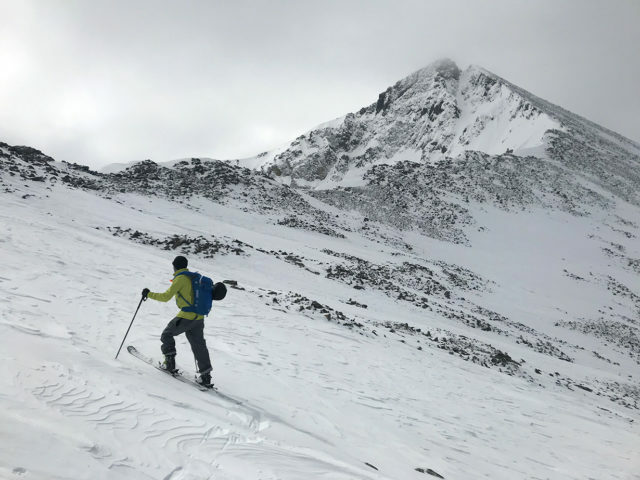 The Hoody version used to be my personal favorite ski touring / mountaineering layer, but the Pullover is quickly taking that role with its stripped-down feature set and much lower weight. I don’t need the hand pockets and hood in most situations in the mountains, so the Pullover version wins for me (plus, I rarely have to take it on / off). But the more you want to use the R1 TechFace as an outer layer, wear it without a pack, or like a hood and hand pockets, the more I’d lean toward the Hoody version. With the R1 TechFace Pullover, Patagonia took one of our favorite pieces and simplified it to make another great piece. And for some people, it could arguably be an even better product. The R1 TechFace Pullover ditches the full zip, hand pockets, and hood from the R1 TechFace Hoody, shaves a notable amount of weight, and retains the amazing combination of weather protection and breathability that makes the Hoody so great. If you like a minimal silhouette and need a softshell / mid layer for high-output activities in the mountains, check out the R1 TechFace Pullover. Sounds like it would do good double duty as a winter mountain bike soft shell when it’s cool, but not raining. 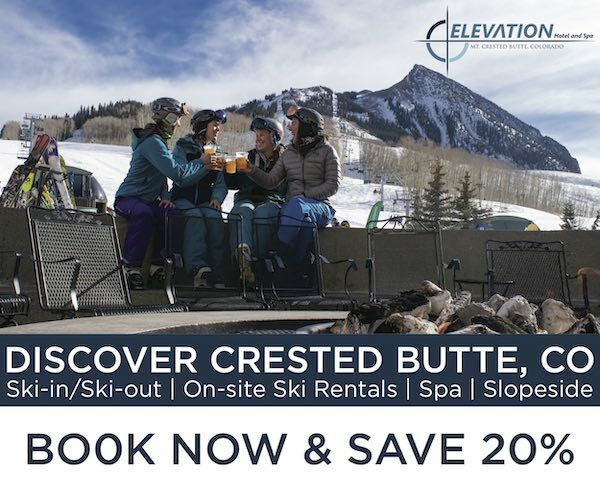 At first glance, it looks a lot like the Arc’teryx Aptin Hoody (a piece I used a lot as this season wrapped up, and have come to think highly of). Any chance of comparing the two in the future?